Effipro Spot-On Small Dog is indicated for the treatment and prevention of fleas and ticks in dogs. EffiPro Spot-On Small Dog - 4 Pack is a Prescription Only Veterinary Medicine and by law requires a prescription from your vet. Description: Effipro Spot-on for Small Dogs 2-10kg is for the treatment of flea and tick infestations. Effipro for dogs can also be used as part of a treatment strategy for the control of Flea Allergy Dermatitis where this has been previously diagnosed by a veterinary surgeon. Presentation and Administration: An easy to handle pipette to be administered topically to the skin preferably at the base of the head and between the shoulders. 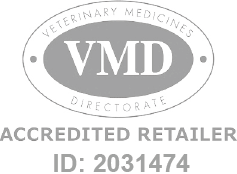 Recommended Frequency of Use: For the optimal control of flea and/or tick infestation the treatment schedule can be based on the local environmental challenge. The minimum treatment interval is recommended to be 4 weeks for the treatment of ticks, and 8 weeks for the treatment of fleas.